I think almost every child loves to play hide-and-seek. Just like Rabbit in Rabbit’s Hide-and-Seek where he and his friends are having a picnic and playing games. 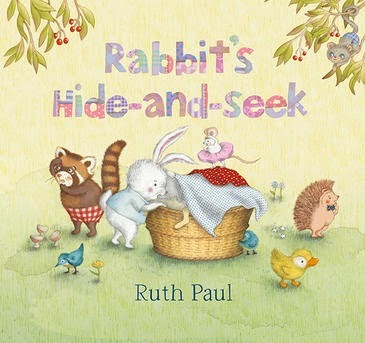 Ruth Paul’s pastel-coloured illustrations and simple text show the animals hiding in various camouflaged situations. First of all Rabbit has to find everyone - duckling, hedgehog, red panda, mouse, and bushbaby. One of the animals has hidden particularly well, though, so Rabbit decides to play a trick, and entice that last animal out of hiding. But there’s one final surprise. Rabbit’s Hide-and-Seek will give children a chance to practice counting to ten with Rabbit, just as they would if playing hide-and-seek for real. Then they can see whether they can find the hidden animals. Yellow flower or duckling feathers? Thistle or hedgehog prickles? Perhaps you could even plan your own picnic where you can read the story together and play a game of hide-and-seek in the back yard!